Otaku Nuts: Fairy Tail Chapter 334 Review - Shattering Of An Iceman! 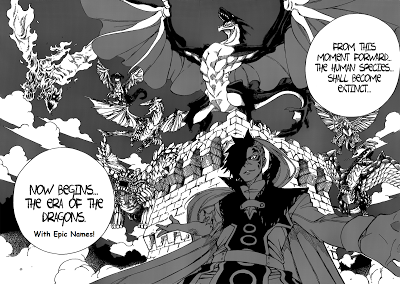 Fairy Tail Chapter 334 Review - Shattering Of An Iceman! And with that, the death count has finally started to make me care. So to start off this surprising chapter, we got to see Milliana confronting Erza and Jellal. Milliana is pissed of course, wanting Jellal to be killed by her hand. 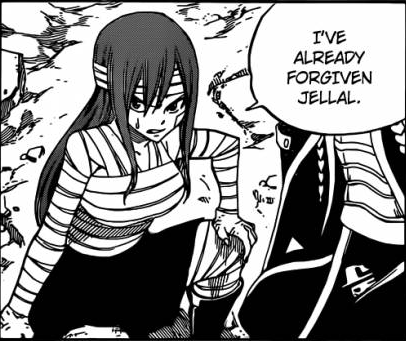 Erza defends Jellal, although frankly I think her reasoning has gotten slightly weaker recently. She really had no way to justify Jellal and calm down Milliana, who has every right to be angry. She was a slave for years! Her best friend died! And now it seems Erza has betrayed her! I'd be upset if Erza betrayed me. Yeah But You Weren't In That Tower So I Think It's Easier For You! I Suddenly Feel Very Close To You, Jellal. Now to easily my favourite part of the chapter. Rogue has come to terms with how he has an evil future counterpart and stands up to fight Barry Revire the dragon now. Sting then pops up and is running around. Rogue is of course surprised that Sting took down his dragon so quickly. Turns out, he didn't and just brought the dragon with him so he could fight back-to-back with Rogue. Rogue just smiles and has faith that Sting will always make sure Rogue doesn't ever turn bad. A lovely scene to be honest. Elsewhere, Meredy finds Juvia and is happy to see she's okay, but wonders where Ultear is. Before they can have a big conversation, Gray saves them both, with Lyon just arriving afterwards. The girls start to focus, but surprisingly Gray wants to actually tell Juvia something. She instantly takes the fangirl reaction and wonders if he'll confess his love for her. And then things take a turn. Probably not permanently but that's not to say this didn't an impact. (I'd consider replacing Claydragon's Wham Moment from his article for this.) We all knew people were going to die here, as evidenced by Future Levy writing a note just before the anime ended. Anime is well-known for bringing back deceased characters and I'm betting this show will be no different. Ironic Considering Somebody Actually Did Die. 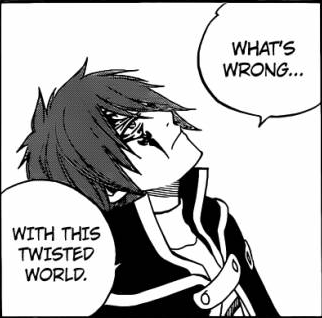 Throughout this chapter, we've had a lot of frustration from Ultear. She's been going around, filled with angst and anger at herself. She considered killing Rogue to save the future and that has made her question whether or not she has a right to live. I think she's being a little harsh on herself, as she is in a war and there was a good chance it could have said her friend's lives. Yes it's wrong but she only thought about it. It's definetly not worth all of the angst and guilt. She's the only part of this chapter that is weak and frustrating, dragging down an other wise brilliant chapter. Overall Character of the Week: Gray Fullbuster for his sacrifice and leaving us all in great suspense about what exactly he was about to say before his tragic end. Predictions: Ultear is talking about how horrible she is, so I'm sure her redemption will come in the form of using her magic to find a way to bring back Gray. Then Juvia will insist he finishes his "confession" and we'll all have a laugh at how wrong she was about it. Natsu will finally find a weakness in F.Rogue's defences. And if we're lucky, Gajeel and Cobra might get some moments we can all enjoy. P.S These dragons have some awesome names! Vote for your favourite in the comments below! Motherglare, Atlas Flame, Scissor Runner, Revire, Zirconis and Maybe More! Predictions: Either what you said, or what we just saw is merely the beginning of F. Lucy's account of her friends' deaths in her diary, which Lucy will use to prevent them from happening. IF that's going to be the case, here's how I want it to go down: the last shot to Gray's head barely missed, but he's still practically dead. Armed with this knowledge from the diary, Lucy gets Ultear to somehow save his life. If not, it'll probably just continue showing the deaths of all of Lucy's friends that happened in the alternate future timeline, which we probably know won't really happen here. That's quite an interesting idea actually. I suppose the diary would most likely contain the deaths of everybody there so Lucy could use that to her advantage. I think, if that's the case, then this will be the clear way to cause the best possible outcome. And with Ultear helping them, it'll probably all work out, if they can defeat F.Rogue in a certain time limit. I still think Gray has died here, but as I said, it's probably not permanent.